He was the brunt of many jokes for years. For years, Jim Christus had trouble maintaining his balance, had coordination and memory issues. He also had trouble thinking and forming new words as well as problem solving and cognitive issues. When people saw this, they would just say “That’s just Jim.” However, this was no joke. His younger sister, Mary, started to develop these same symptoms. Mary was then suggested to be tested for Huntington’s disease (HD) and she was positive. In 2010, Jim was also diagnosed with the disease at the age of 62. It went from being a joke to life threatening. HD is a fatal genetic disorder which causes progressive breakdown of nerve cells in the brain. It can be described as having ALS, Parkinson’s and Alzheimer’s – simultaneously. The reasons of why he was made of were symptoms of HD. The more he learned about the disease, the more he looked back on his life. He also looked back at his previous marriage of 27 years. They ended up getting divorced and he believes that HD had a lot to do with that. He remembers the drinking and bad temperament which are also signs of HD. Jim also realized that this disease would affect his three children. Each child of a parent with HD has a 50/50 chance of inheriting the faulty gene that causes Huntington’s disease. Currently, they have all decided not to be tested. However, each of their 7 children have a 50% chance of being gene positive. His children are not alone of deciding to not be tested. Only 5-10% of all at risk patients decide to be tested. He is not giving up. He goes to speech therapy exercises regularly and tries to improve his cognitive skills through brain games. Even though he can no longer drive, Jim appreciates nature more and the landscape as a passenger. In spite of that, Jim has received the full support to the people that truly matter in his life. He also is grateful for the HD support group. He attends monthly support groups and considers them helpful as he met more people with HD. He is an active member of the HD community. Even though he has balance and coordination issues, Jim is a runner and can still run a competitive 5k in a little over 30 minutes. He proudly supports the Huntington’s Disease Society of America (HDSA) t-shirts as he wants people to know more about the disease. He was covered in Runners World for not letting HD affect his running and how being active can keep a positive effect on both the mind and body. Not only has Jim participated in HDSA Team Hope Walks/Runs, he has attended local fundraising events that include HD Bingo and the Madison Wisconsin Re-Prom fundraiser, where he was crowned 2016 Re-Prom king. Jim and Barb were also the keynote speakers at the 2018 Wisconsin state conference. They also spoke alongside other panel members at the University of Wisconsin- Madison, one of the 47 HDSA Centers of Excellence (COE) facilities, to first year medical students as well as being a study subject at Froeder Hospital for UVM physical therapy class. COE facilities provides patients with expert neurologists, psychiatrists, therapists, counselors and other professionals who have deep experience working with families affected by HD and who work collaboratively to help families plan the best HD care program throughout the course of the disease. Jim has lived life to the fullest with trips to Hawaii and Alaska. According to Jim, he has had wonderful years of fun, laughter, excitement, and adventure with Barb. He continues to do that everyday of his life. 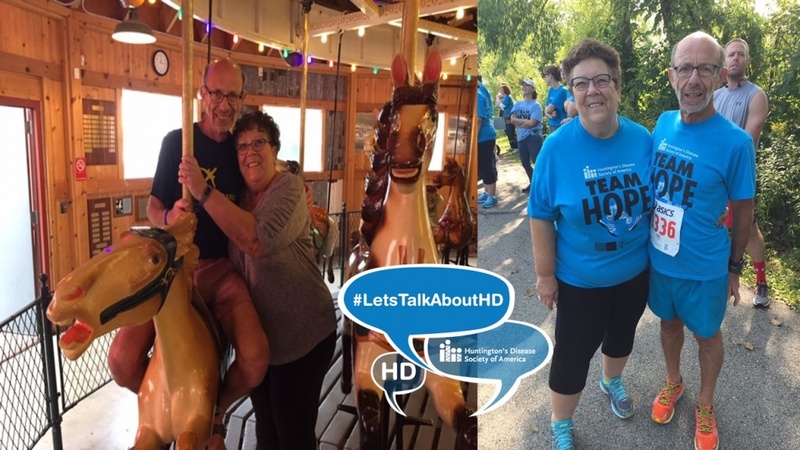 The Huntington’s Disease Society of America (HDSA) is the premier nonprofit organization dedicated to improving the lives of everyone affected by HD. From community services and education to advocacy and research, HDSA is the world’s leader in providing help for today and hope for tomorrow for people with HD and their families.